Kleine Schwalbe - ZineWiki - the history and culture of zines, independent media and the small press. 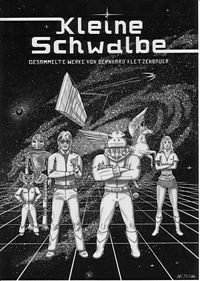 Kleine Schwalbe (German for "Little swallow") is a one-shot zine with 107 collected articles spanning nine years of science fiction-fandom activity. It came out in September 1987, and is by Bernhard Kletzenbauer. It contains one poem, six short stories, nine comics, ten stories, twenty nine graphics and fifty two cartoons, as well as some partial original manuscripts, all science fiction related, and the third and fifth edition of Perry Rhodan. This page was last modified on 11 March 2012, at 22:51.